Bible Study cards are one of the most effective ways to share the message about Jesus. These mailed cards offer you an opportunity to reach members of your community that are not connected to Adventists in your area. These are people desperately looking for answers that can only be reached through direct contact. Each card in our library is being constantly tested for maximum impact in communities across the country. We use two capture methods for increased effectiveness– Online requests and telephone responses. This combination allows the most types of recipients to engage with your offer. It also allows every card to be a powerful tool for Christ that can reach person-after-person. Unlike, mail response cards, these cards are always effective at giving someone an opportunity to respond. This unique method, along with SermonView’s demographic analysis, helps your church maximize their budget by reaching the most people. Our professional designer creates stunning imagery that is sure to catch the eye of your community members. Your unique code allows your cards to be a powerful, ongoing tool for Christ. No matter when these cards are seen, interests can call or go online to engage with your local offer. Listing an interesting incentive (free Bible study guides, book, etc.) with a specific call-to-action (sign up today!) will garner a higher response rate. Looking for a specific campaign? 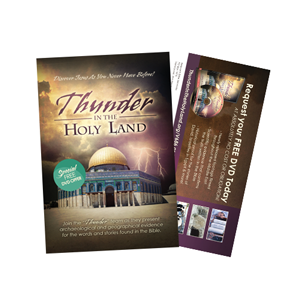 Here are the most popular Bible Study Cards we offer. 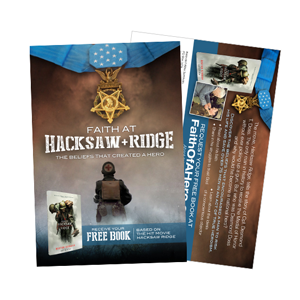 Share the gripping story of Desmond Doss and use the Bible Study card to invite members of your community to join your church for a Bible study, or offer a free book or resource. Books must be purchased separately (find them here).